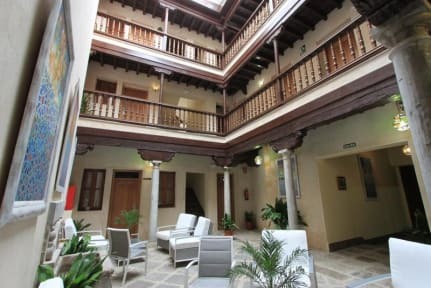 In a privileged place in Granada, behind the Town Hall and next to Calle Navas, street reference of 'tapas' in Granada, this beautiful renovated building offers its guests an unsurpassed beauty and tranquility. The Hostel Casa Mercader de Sedas Property has a typical Andalusian patio to share the ride, seating area with books and bar serving Spanish food. The dormitories at Hostel Casa Mercader de Sedas have individual lockers and each room has its own bathroom. Upon entering Hostel Casa Mercader de Sedas Property guests amazed when they see the large gallery that serves as distributor to the rooms. All are kept in detail, where both beds as roofs, doors and windows are wooden. Each room has a card entry, so that only the occupants can enter, Al-Andalus Property being a safe place to enjoy the company and the trip. The bar of Hostel Casa Mercader de Sedas is a marvel, where specialties are baked and grilled. There is also a wine to enjoy the best wines. Op zich zeker wel een oké hostel. Het ontbijt was goed. De kamers in orde. Niet al het personeel was even hulpvaardig en het hostel vroeg geld voor alles (zelfs voor city maps die je in de meeste hostels gewoon gratis krijgt). Je kreeg een beetje het gevoel dat ze vooral zoveel mogelijk geld uit je wilde halen.